Voters have been turning out in force all day Monday at polling stations across Calgary to choose a new mayor, 14 city councillors and a new batch of school trustees. In what many observers have characterized as the city's tightest mayoral race in several years, voter turnout has far exceeded 2007 levels, city officials said. By 4 p.m. MT, 141,826 voters had turned out. At that hour in the contest four years ago, only 84,304 voters had shown up. Political scientists were predicting a higher-than-usual turnout for the civic election, thanks in part to the close race for mayor that developed after Dave Bronconnier decided not to run for a fourth term. 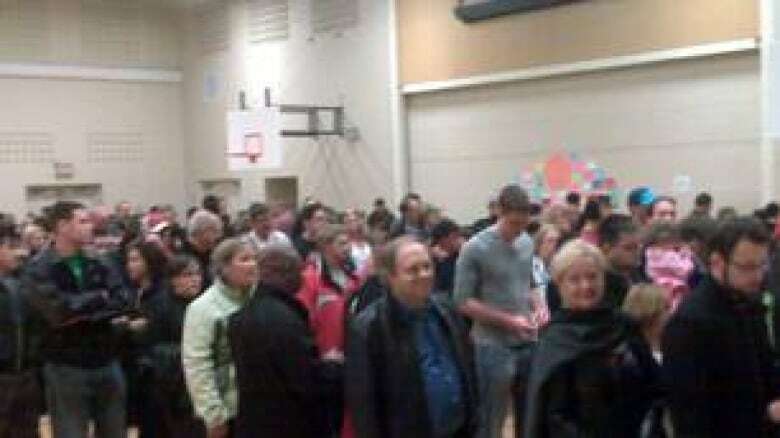 "They were packed out there before we opened the door," said Bev Wotton, a returning officer in the city's southwest. "We were very surprised that there were so many this morning." In Crescent Heights, north of downtown, normally quiet streets bustled with voters by late morning. "This is a really quiet residential area during the week, but this morning there is no parking for two blocks," said CBC reporter Jocyln Cozac. "There is a steady stream of cars." Lisa Young, a University of Calgary political science professor, said the exciting race could inspire more people than usual to make the trip to the ballot box. 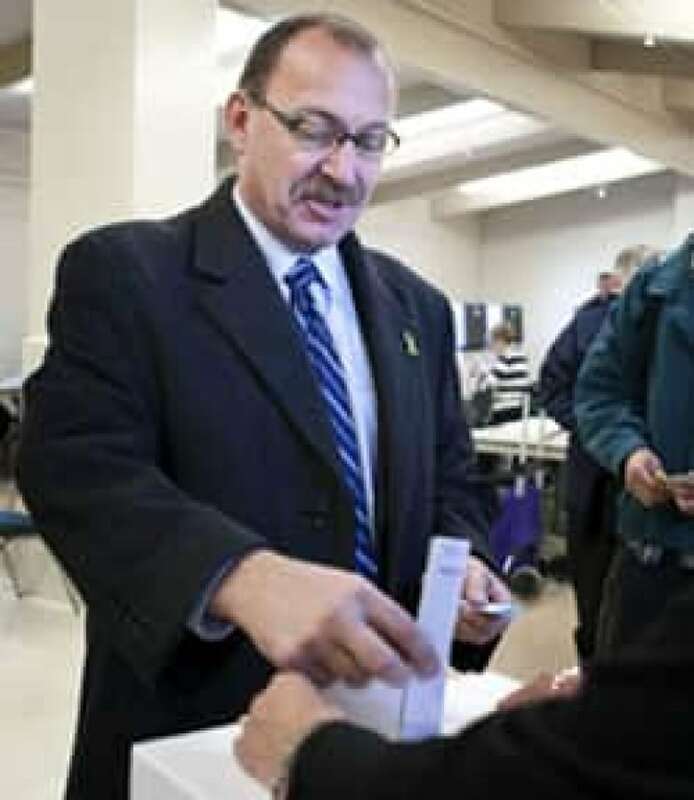 Calgary mayoral candidate Ric McIver casts his ballot Monday. ((Jeff McIntosh/Canadian Press)) "It might very well be a photo finish," Young told CBC News. "So certainly that notion that 'my one vote might make difference to the outcome' is going to make a pretty significant difference, I think, to people's decision whether it's worth their time and energy to go out and vote. "I think that will be one of the big drivers of voter turnout today." Calgary's mayoral candidates and their volunteers were helping voters get to polling stations. "This is going to be the tightest race Calgary has ever seen," said mayoral candidate Naheed Nenshi. "Every single person needs to vote for the person they like best. There's no more strategic voting." Along with Nenshi, 11 other people are in the running for mayor including Ric McIver, Barb Higgins, Joe Connolly, Jon Lord, Barry Erskine, Bonnie Devine, Oscar Fech, Gary Johnston, Dan Knight, Sandra Hunter and Amanda Liu. Organizers of several grassroots campaigns to stir up interest in the election are also hoping their work pays off Monday. Mayoral candidate and former TV anchor Barb Higgins casts her ballot at voting station in Calgary. ((Jeff McIntosh/Canadian Press)) Political activist Grant Neufeld said websites, such as calgarydemocracy.ca, have helped people feel connected to the campaign, the candidates and the issues. "As we make the information more accessible, that reason for not voting will hopefully go away," Neufeld said. Calgarians made a strong showing at advance polls last week, with nearly double the number of total votes cast in the 2007 election. Voter turnout was 33 per cent for the 2007 municipal election and less than 20 per cent in the previous election in 2004. Young expects to see the number rise to between 40 and 50 per cent by the time polls close at 8 p.m.
"We couldn't have a better situation than we have right here," Young said. Calgary's chief returning officer, Barb Clifford, urged voters not to wait until the last minute, noting that lineups have already started ahead of the traditional peak voting hours in the early evening. She said any voters who are still standing in line when the polling stations close will still be allowed to cast ballots.